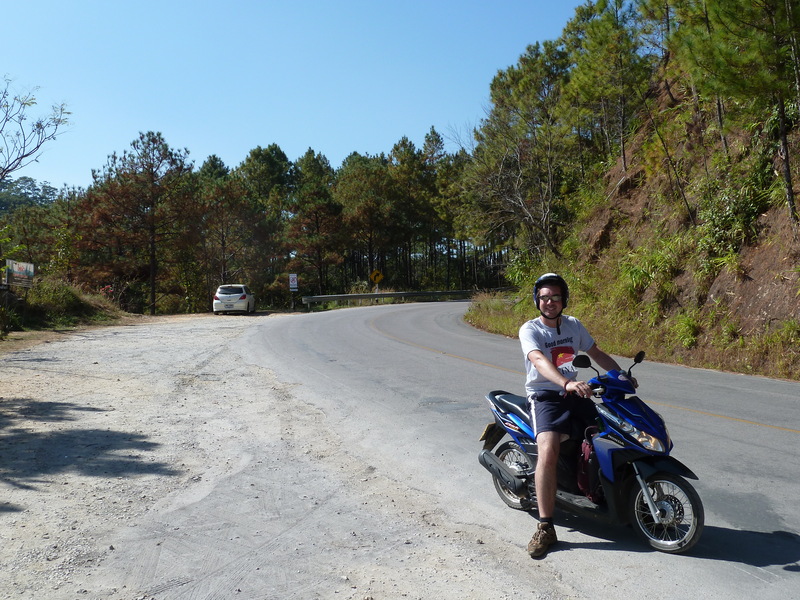 My new-found love affair with motorbikes was about to come to an abrupt end. 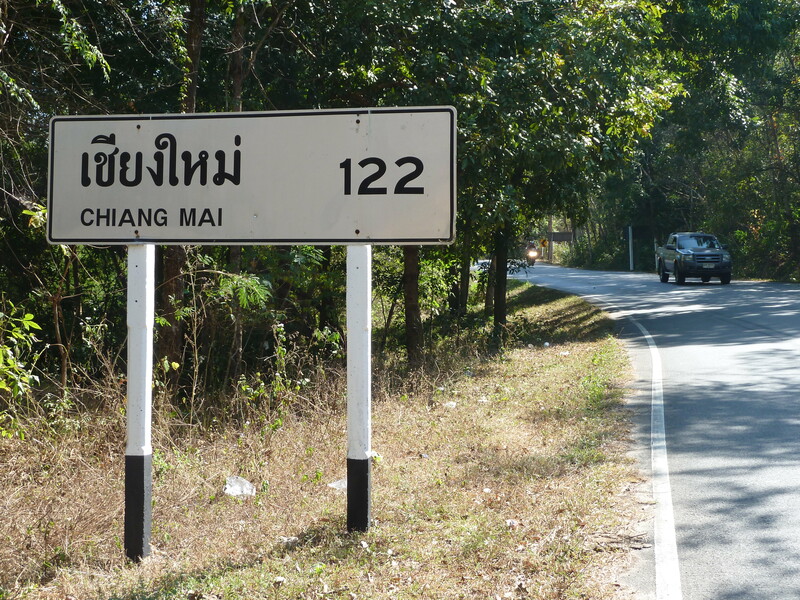 We left Pai around lunchtime, with the aim of making the 155km journey back to Chiang Mai as much a day out as it was a trip back to our belongings at the Spicy Thai hostel. With waterfalls, hot springs, geysers and mountains to explore, it promised to be an exciting ride. 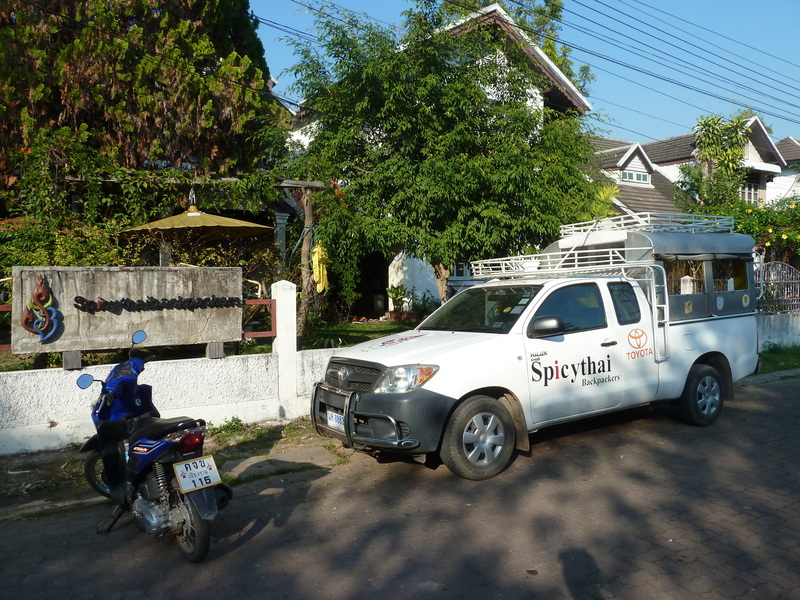 Half of Chiang Mai's scooter rental stock outside the Spicy Pai hostel! What we didn’t factor in was a speeding minibus driver who shot around a hairpin bend, running both Krys and I off the road. The day had started well, although Liz tempted fate by asking to ride as my passenger as I looked to be a good driver, and it would give Krys a chance to ride on his own. I agreed, and we loaded up with our two bags and set off in convoy. The weather was perfect- glorious sunshine, a gentle warm breeze and some of the most picturesque roads in the country made for a lovely day to be out on a bike. 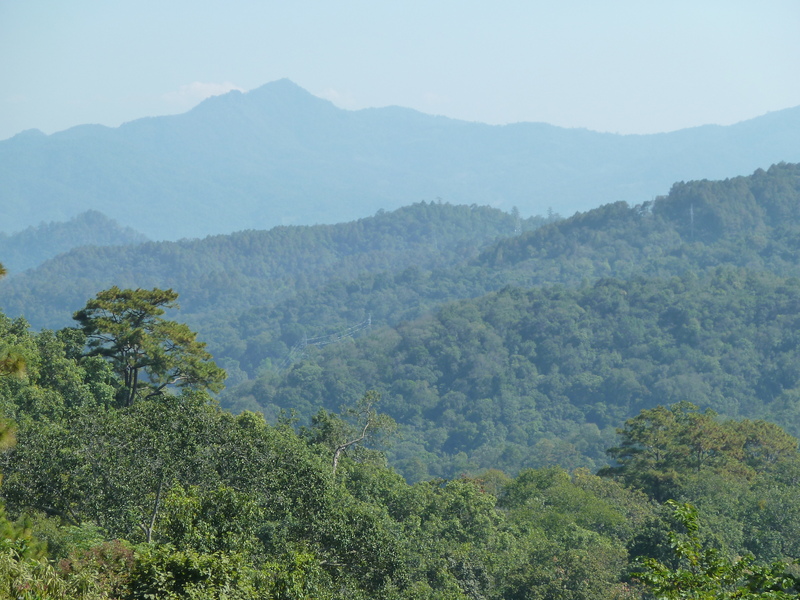 There were places where it struggled, purely with the weight of two people and all our belongings up some very steep stretches of roads in the mountains. We didn’t quite struggle as much as some of the lorries we got stuck behind, belching fumes and grit into our faces, but we forgot about that when we stopped at some of the sights. 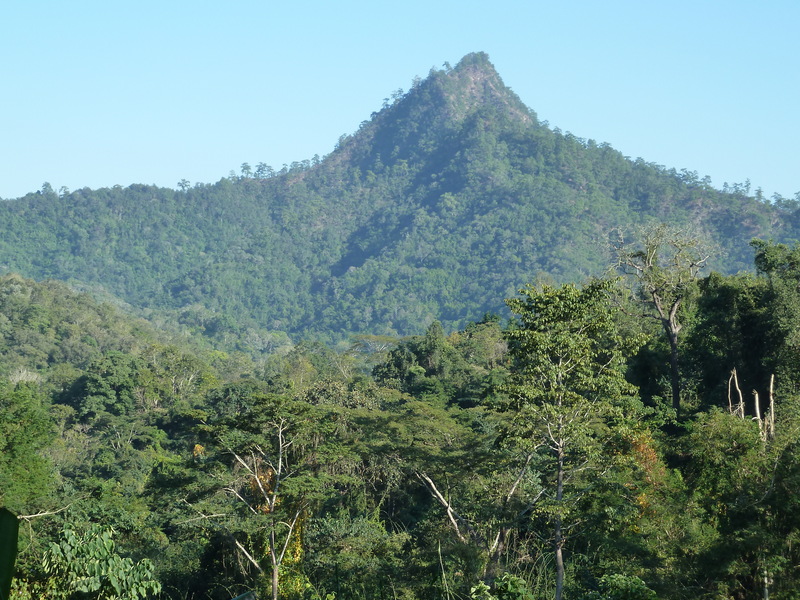 Lush, green, jungle-clad mountains contrast so well with beautifully clear blue skies, and some of the viewpoints and lookouts provided memorable views. 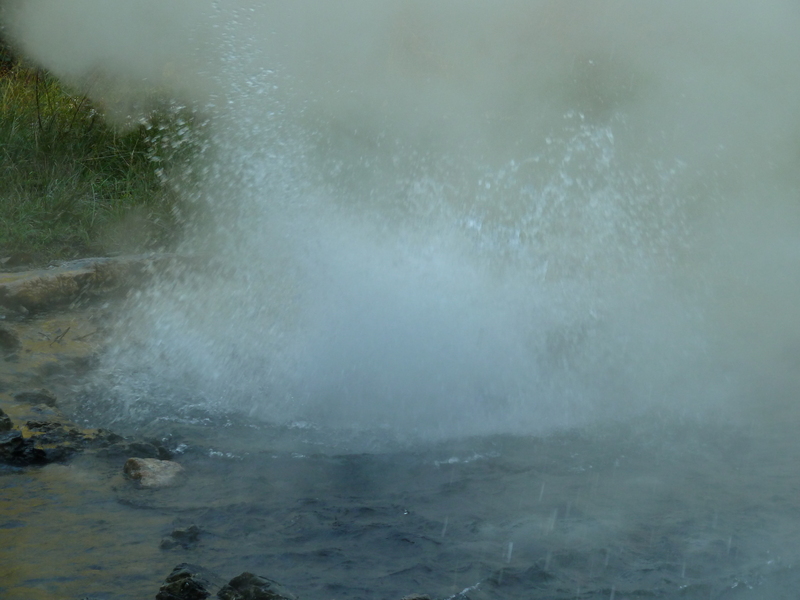 We were on our way to tick off the geysers from our ‘to see’ list when disaster struck. The road to the geysers was more of a track off the main road. We’d just stopped off for a few minutes break at a small shop, and Bryce entrusted me with a bottle of locally made strawberry wine, which I put in my scooter’s drink holder. Then we tackled the road, and I immediately took it steady – patches of slippery sand, gravel and potholes meant it was a tricky road to navigate on two wheels. I was taking it relatively slowly – which is more than can be said for the driver of a silver minibus that suddenly just appeared right in front of us and on our side of the road. He’d shot straight round a hairpin bend we were turning into, but veered out into our side of the road. Krys took evasive action in front of me, diving to the left out of the way of the minibus, but then stopping right in front of me. I took even more evasive action, pulled hard on both brakes, steered to the left, and that’s when I knew we were in trouble. Not only had I run out of road, I’d gone straight into a sandy part of it at the edge. Everything then seemed to happen in slow motion – the front wheel locked and skidded, I saw it turn underneath the bike, there was a bit of a lurch through the steering, the bike went one way, I went another, and then I remember heading down towards the ground. There was a thud. I hit it pretty hard. In the slow motionness that was still going on, I looked round to see Liz heading down towards the tarmac too. The scooter was resting on my leg, half sticking out of the undergrowth at the side of the road, engine still running. I checked if Liz was ok – there were no tears, and more importantly, no blood from her. The strawberry wine was still intact too. In my head my thoughts started to go around checking all my limbs. I could still feel everything, and I wasn’t in a great deal of pain. I stood up, and glared at the driver and his passenger. He looked sheepish. His passenger looked concerned. My next concern was the bike – any damage and i’d be in trouble. Repairs are known to cost foreigners a lot in this country, mainly as it’s a good way for rental places to boost their coffers. Thankfully, nothing seemed broken. There were a few scratches on one of the plastic panels, and a bit on the footplate, but that was it. 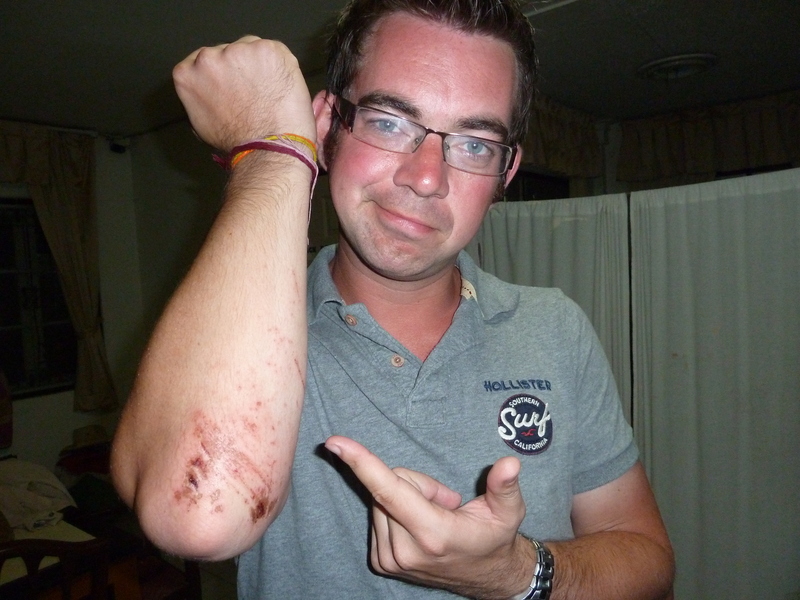 Then I looked at my elbow – it was bleeding, and there was sand and grit stuck all over it where I’d momentarily slid on the tarmac. The same could be said for my knee. We carried on and caught up with Bryce and Erin, who had started to wonder what had happened. They looked surprised when I showed them my arm, which by now had a trickle of blood running down it. We headed to a visitor centre at the geysers, and I ran my arm under a tap for a good 10 minutes to try to clean the wounds. There were three deep cuts on my elbow, one of which was particularly deep, and was close to needing a stitch. Erin and Liz raided my cheap Tesco first aid kit I’d taken along with me (just incase!) and rubbed antiseptic cream and wipes all over it. I turned away and gritted my teeth. I think Liz offered me some sort of cloth to bite on. The fuss over my arm meant I’d not realIy checked anything else, and then I found a bit of road rash on my chest from yet more gravel on the road. The girls used a whole roll of Band Aid tape to hold some antiseptic wipes in place as a makeshift bandage. Having alcohol permanently in contact with the cuts wasn’t the slightest bit comfortable, but with hours to go yet on the journey, it was the only thing we could do. We went on to see the geysers, even though I was feeling a bit sorry for myself, and a bit guilty for injuring Liz too. She had a graze on her upper leg, but kept assuring me she was ok. The geysers bubbled and steamed away thanks to the red hot rocks below us. 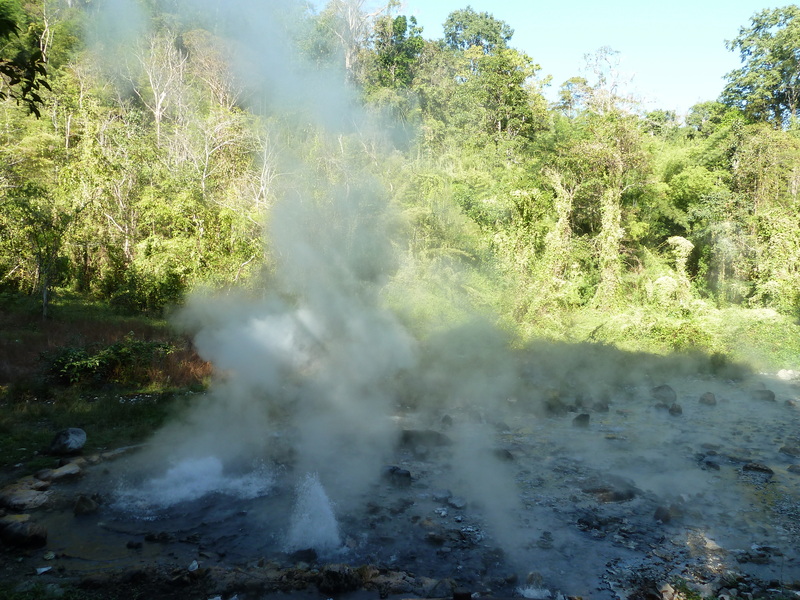 Thankfully the warm breeze was blowing the sulphury, eggy steam away from us, and we stayed for a good half an hour, being mesmorised by the constant noise and energy being emitted from deep within the earth. Bryce threw a rock into one, but sadly it wasn’t catapulted back out. They were by no means on a par with those i’ve seen in Iceland, but impressive to just come across as part of a national park in Thailand. Then it was time to get back on the scooter. My confidence had taken a massive knock, which was a shame because I’d absolutely loved the experience and felt totally in control. Sadly, as good a driver or rider you may be, you can’t do anything about the bad driving of others. I was just grateful I was driving slowly and carefully, otherwise things could have been much worse. 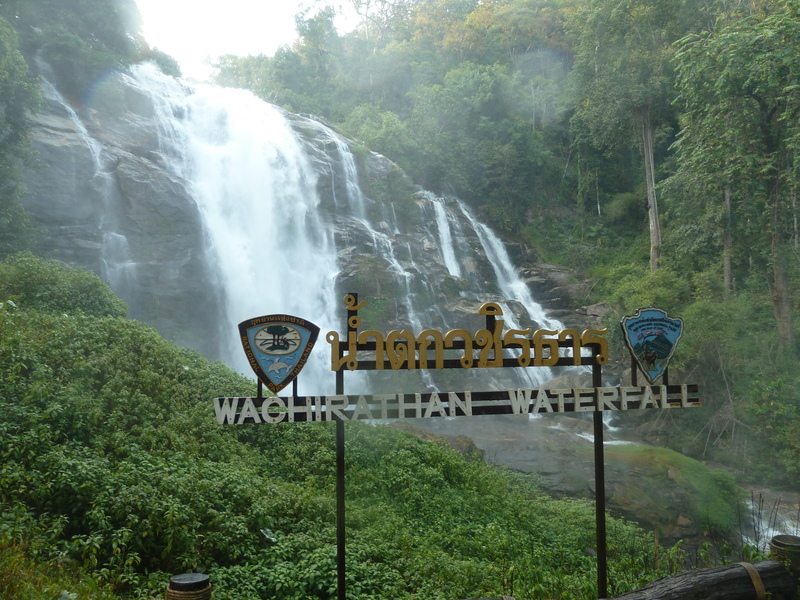 Waterfall on the way to Chiang Mai...i'm still covered in dust from my close examination of a road surface. 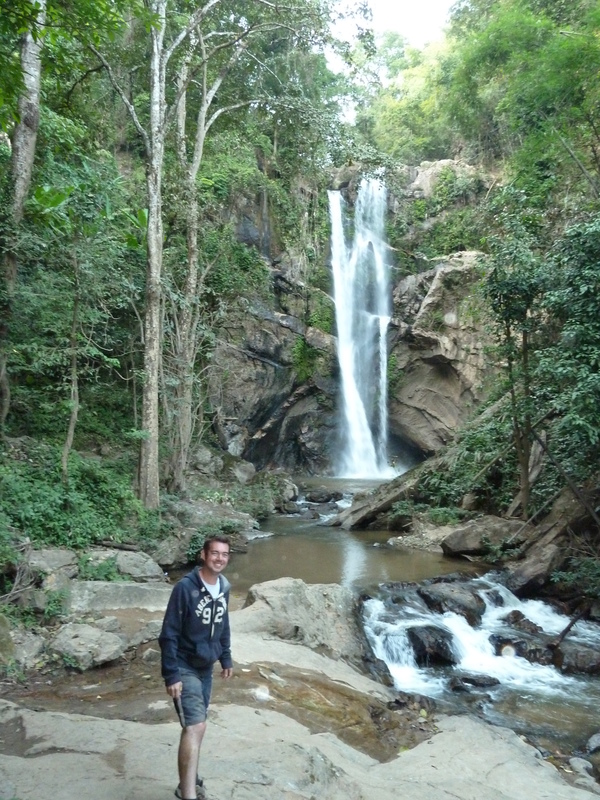 We took in another waterfall on the way back before arriving back into Chiang Mai that night. After a much needed shower to wash the rest of the dust and dirt off me, I felt a bit better, but knew I’d be sore for a while as it heals. And I knew I’d get a massive bruise on my leg too from where I landed, mainly as it had started to stiffen up and given me a limp. Our bikes knew where the good street food lived! As usual, we started out late – too late in all honesty – but we were determined to at least make it to the national park the mountain is in. 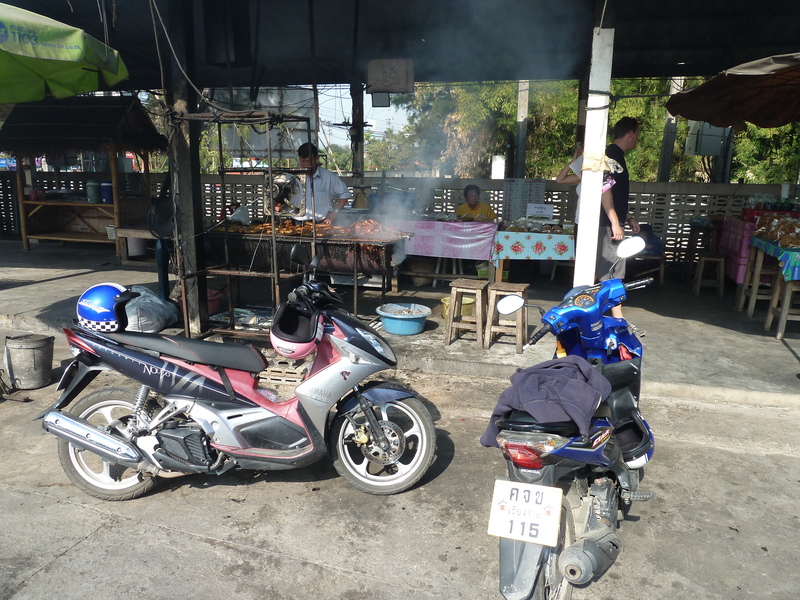 On the outskirts of Chiang Mai, we had to stop for something to eat as we knew it would be a good couple of hours riding in each direction. Bryce spotted some smoke, and we dived off to the left and up at muddy ramp towards some wooden shacks. There was a barbecue on, and some particularly good looking sausages and mystery meat. I asked for a sausage and wanted to know how much. “One kilo, 30 Baht,” the man said. That was the equivalent of 60p. Surely not. Bryce looked in amazement at the price. It meant we could buy the whole barbecue for about £2, though I have no idea what we’d do with that amount of meat. Then the man’s assistant came over. 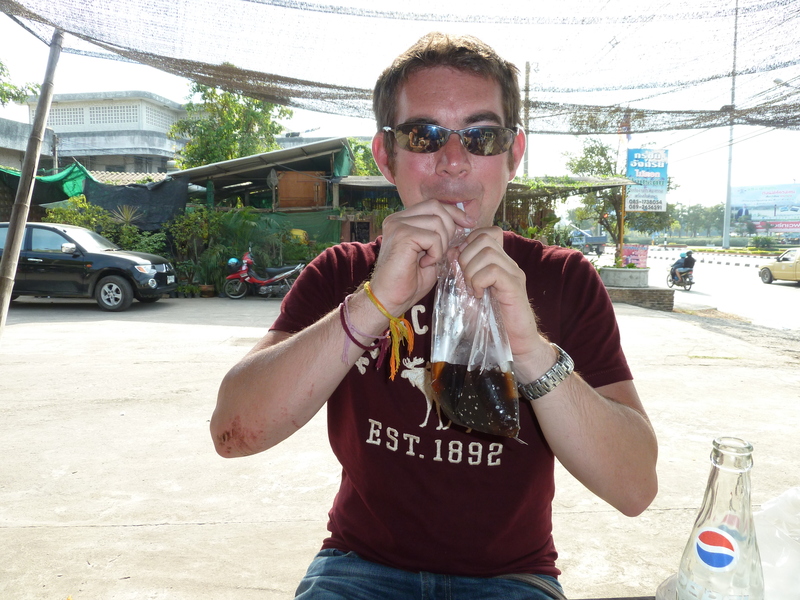 Turns out it was 300 Baht for a kilo – about £6. Sometimes things get lost in translation. I’m just pleased I ordered one sausage! Plastic bottles are so last year! 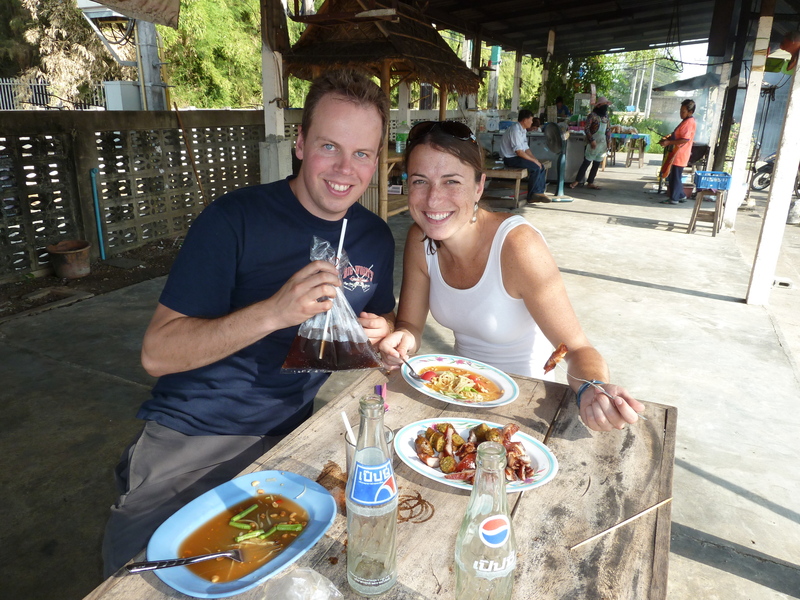 That’s when we tasted it – it was some of the best barbecued meat I’ve had. Erin got a portion of pork, and while a lot of it was fat, it was edible and very tasty fat! Between us we had the entire tray, I ordered another sausage to go, and with a bag full of Pepsi (they keep the glass bottles – interesting way to drink pop, but it works!) we were back on the road. We found some really impressive waterfalls – the sheer noise and power of the water from a river falling over the edge of a cliff never fails to impress. 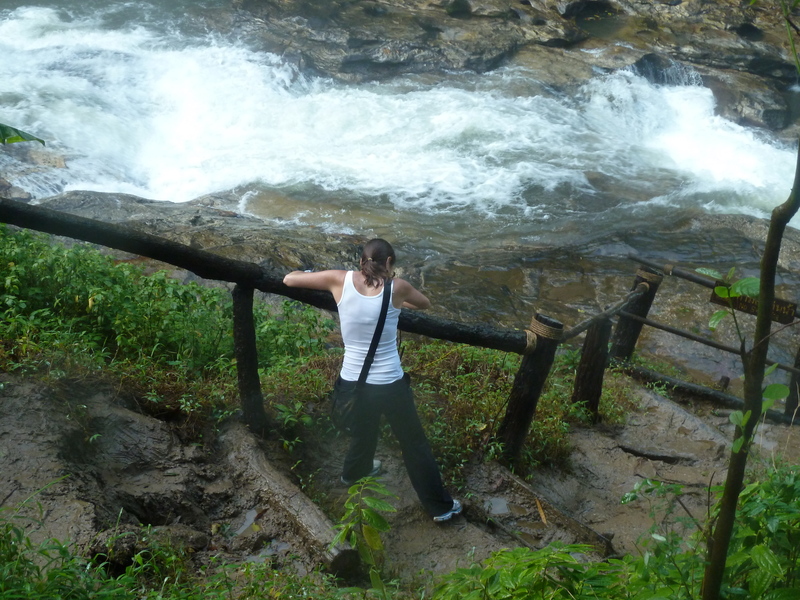 The spray was drifting all over, and had made a walkway down the bottom really muddy, which in turn made Erin really muddy. With my stupid limp and not wanting to risk another fall in as many days, I stuck to the safer path. We then rode for 20 minutes to another waterfall, before deciding that we just about had enough time and daylight to head further into the park and towards the main mountain. 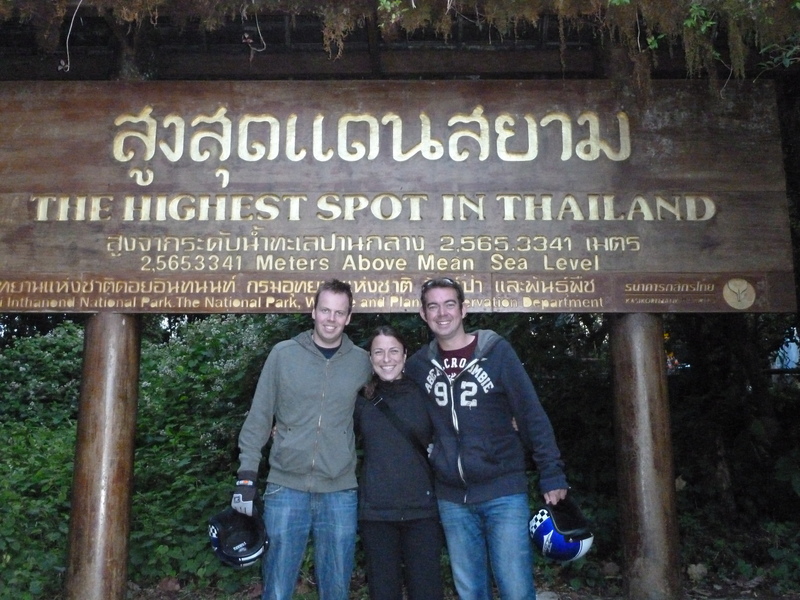 After all, it’s Thailand’s highest point – we’d got this far, and if it meant riding home in the dark, then so be it. The roads began to get steeper, and the engine on my scooter began to sound more and more like it was about to cut out. The higher we got, and with less oxygen in the air I’m presuming, the worse my scooter got. I had the throttle fully open, but could manage a measly 20km/hr in many places, meaning Bryce and Erin were constantly ahead of me. And then I noticed the fuel gauge. It was almost showing empty, and we were miles away from any kind of petrol station. Still we climbed, and by now the air was getting cold. Thankfully my oversized hoody came in handy again – the extra long sleeves double up as gloves, and were much needed as the cold air blasted against my hands. 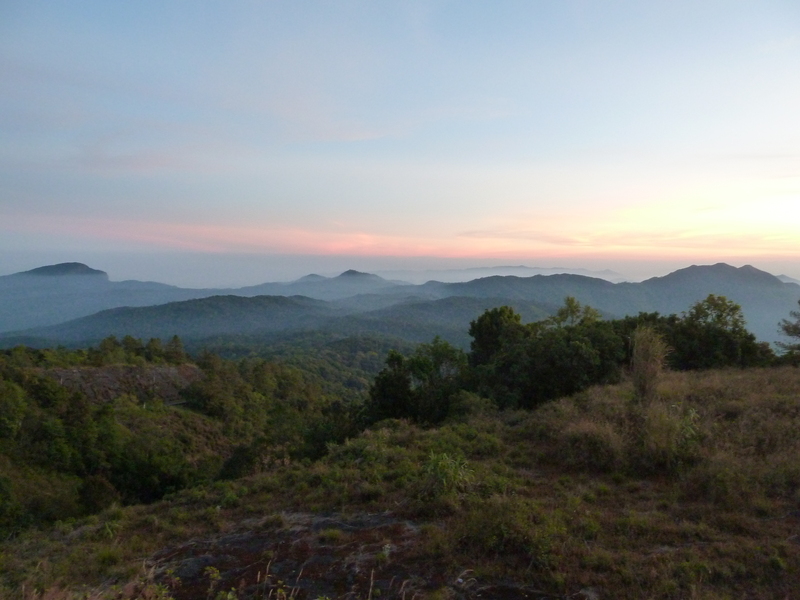 After about an hour of climbing, we suddenly hit a bend in the road with an incredible view. With trees all around, we’d not quite realised just how much we’d been climbing, but suddenly the whole world was below us. We carried on further, finding a viewing area with car parking space and a shop. 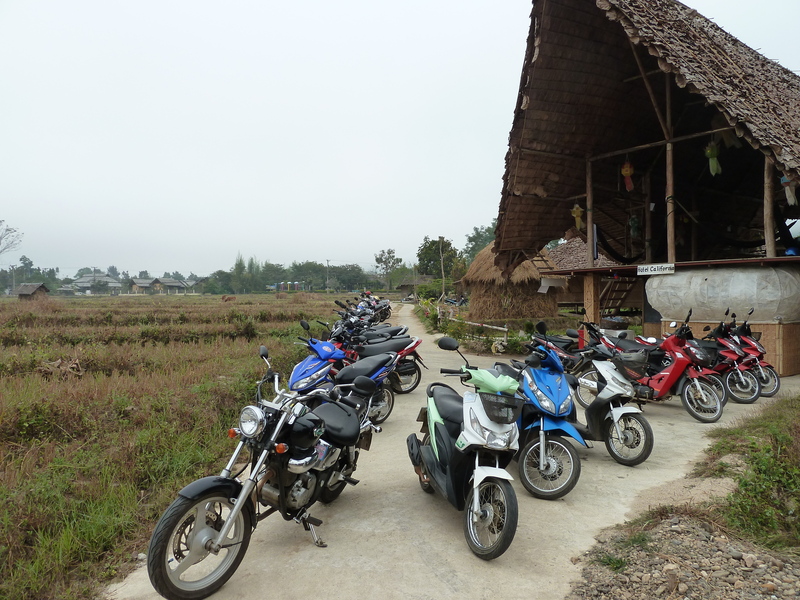 It had a great view of the neighbouring mountains, and after a few quick photos, I had a more pressing need in the form of fuel for my scooter. A guy with a barbecued chicken stall came to the rescue, magically producing a container of yellowy liquid from behind the toilet block. I was hoping it was petrol. He looked into my tank, swished it round and said I had enough to get back down the mountain. The only problem was, despite the sun beginning to set, we wanted to go further up the mountain, so with £1 handed over, he gave me a litre. 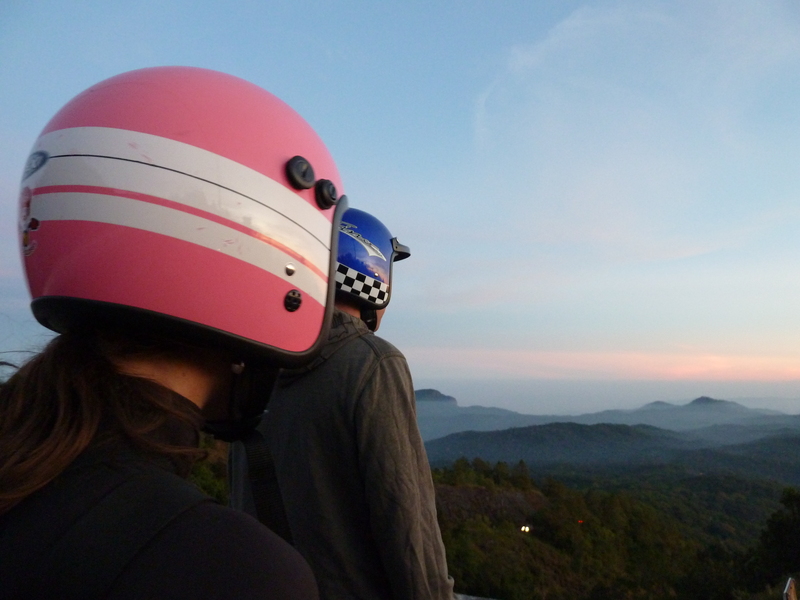 After 15 arduous minutes for my struggling scooter, we made it to the very top, the highest peak in Thailand. 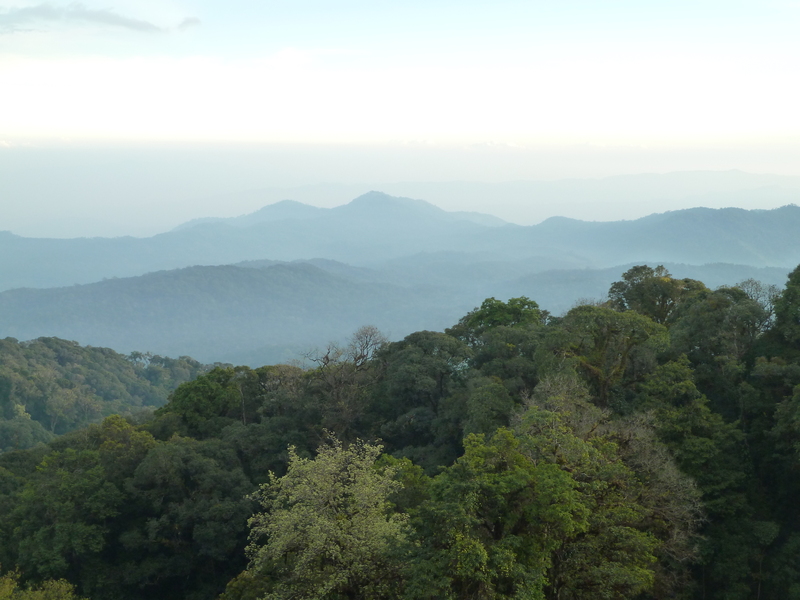 There was a military installation with huge signs saying ‘No Photographs’, a sign marking the achievement of reaching the top, and a lot of trees blocking most of the view. We walked through them hoping to get a clear view of the sunset, but there wasn’t one. We took the decision to head back down to the initial bend we came across with a clear vista across the whole range. Not a bad scenic road! We arrived just in time. 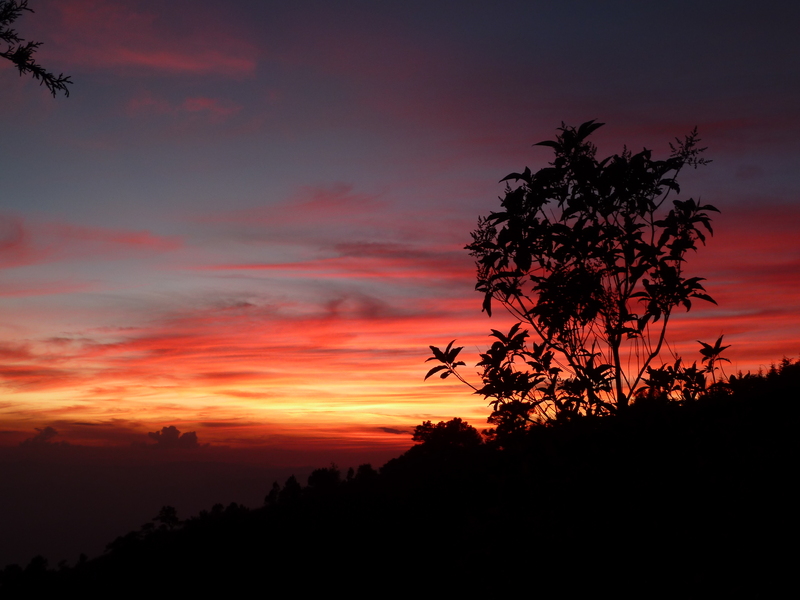 The sun was setting, the sky was a bright orange and pink colour, and it was perfect for a few memorable photographs. It was a great sense of achievement making it all the way to the top, and there was a similar buzz of excitement from the many other tourists who’d stopped alongside us to take in the view of yet another day coming to a close. Except for us, there was still more to come. The ride back was thankfully trouble free, and waiting for us was Liz with our bags of washing she’d kindly retrieved from the laundry. It meant that it was our last night together. Downstairs in the hostel, everyone was already in good spirits after a good few hours playing drinking games around the table while we were out. We decided to do some serious catching up thanks to supplies of strawberry wine (!) vodka, Red Bull and Coke, and headed out to a nearby bar where we once again made friends with Mr Sang Som, the local whisky. Sang Som...everyone's favourite Thai friend! 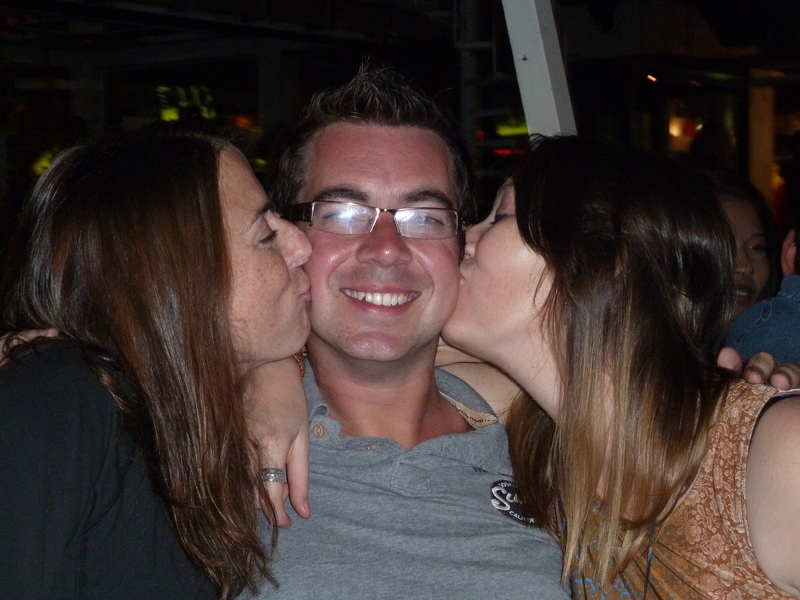 We had a brilliant night together, full of banter, laughs and chats about all the things we’d done together. Erin still maintained she hated Canada. Bryce still maintained Canada was better than America. Liz was Australian and so gave me lots of Pom abuse. I returned the favour. It was great fun. This had to go in the blog! Towards the end of the night, Sang Som clearly kicked in! Early the next morning, we waved goodbye to Liz as she left at 8am to get her flight to Cambodia, where she’s spending the next few weeks. Bryce, Erin and I managed to give some newcomers a bright and cheery welcome as they tiptoed into the room, not long after Liz left, as they were trying not to wake anyone. 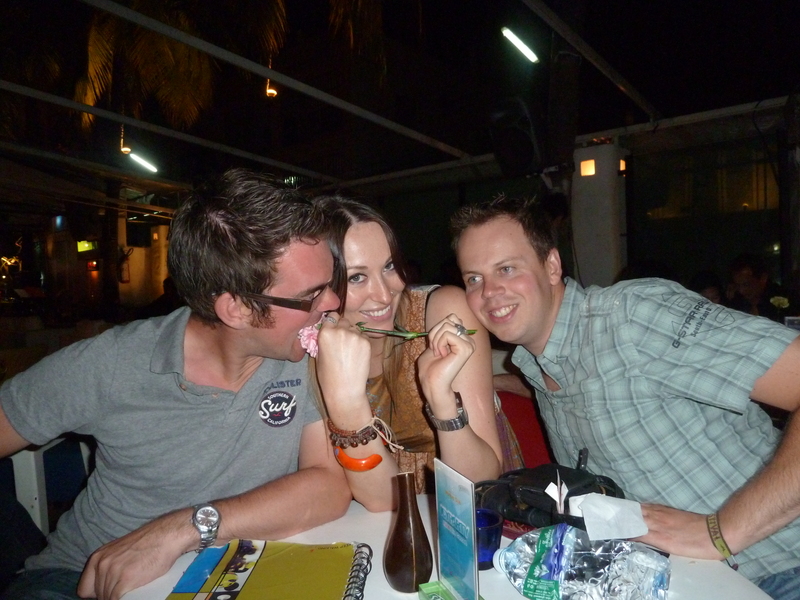 Somehow, we were all wide awake and in really funny moods and had a good laugh between us and with them. Then we crashed out again, waking up at 11am with agonising hangovers. The Sang Som was obviously still in our systems early on. 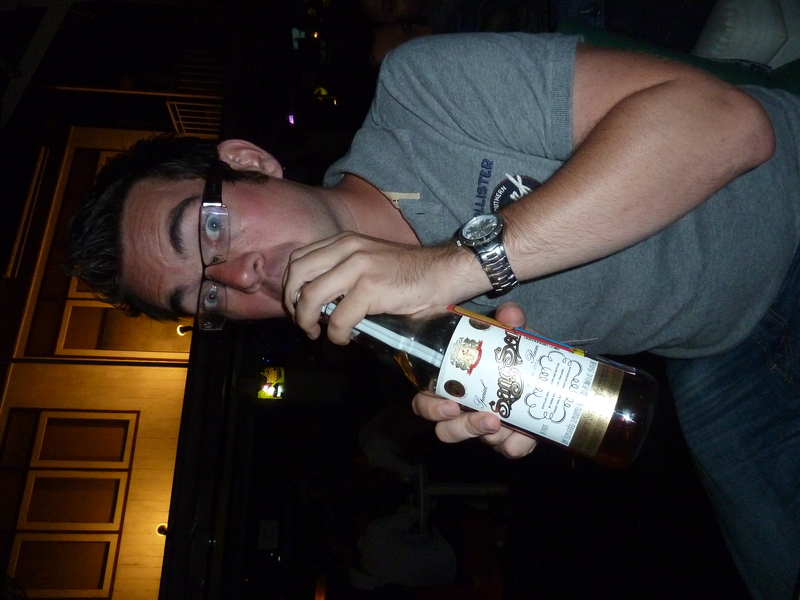 It’s a funny tipple that stuff! I too needed to head off south. 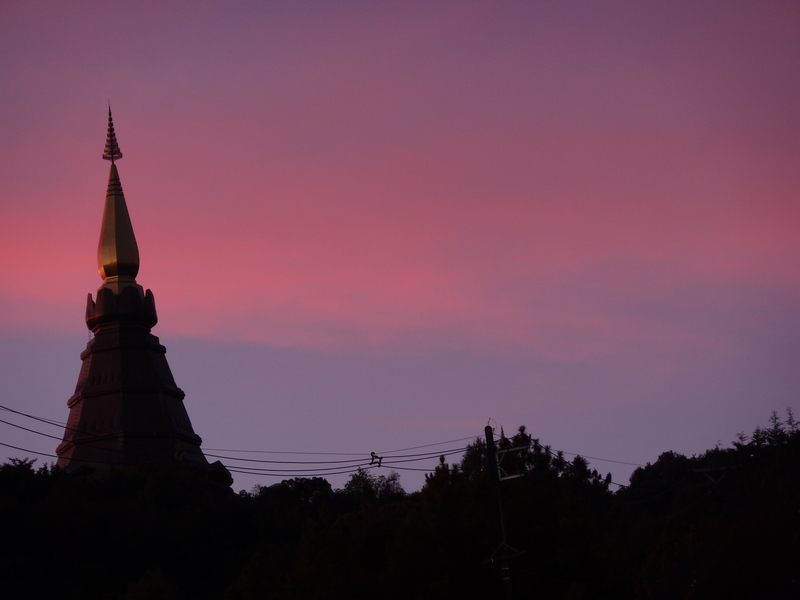 I’d spent far longer than I intended in Chiang Mai, and with only a few days left on my 14 day visa from the Laos land border, I needed to come up with a plan. 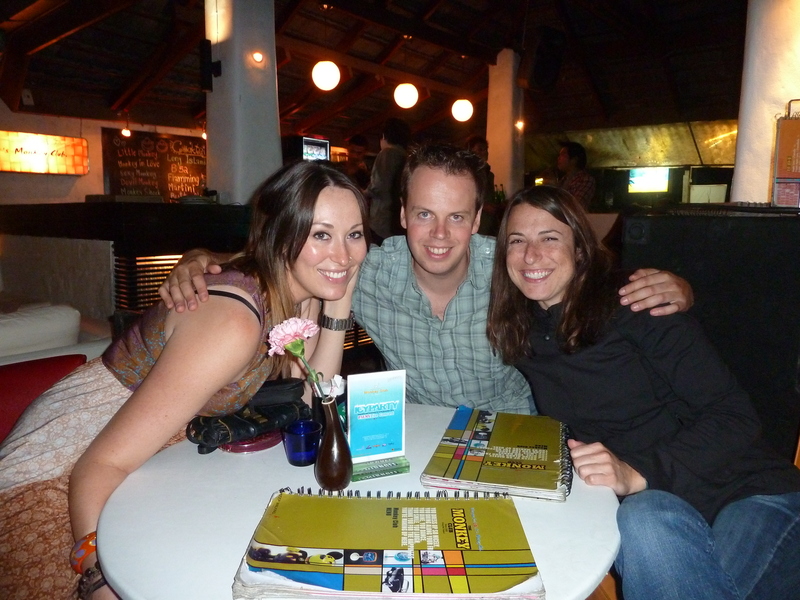 In Pai, I’d made a huge decision to spend New Year in Thailand with Bryce and Erin at the New Year Full Moon party. It meant that I wouldn’t be in Sydney for new year, as was my original plan. I figured that I’d already experienced the fireworks around Sydney Opera House a few years ago, and that I felt there was still a lot I wanted to do in and around Thailand. It was a sacrifice – the earliest flight I could get to Sydney from Thailand on my particular ticket wasn’t until January 29th. It means another month and a half in this amazing country, but plans to meet friends and celebrate with them in Australia would have to be put on hold. The other problem is that I’d need to make a visa run to another country to renew my tourist visa. If you cross by land, you get 14 days stamped in your passport, but if you fly into Thailand you get 30 days. It’s a bit of a pain, but means I need to leave the country, go somewhere and then fly back in. 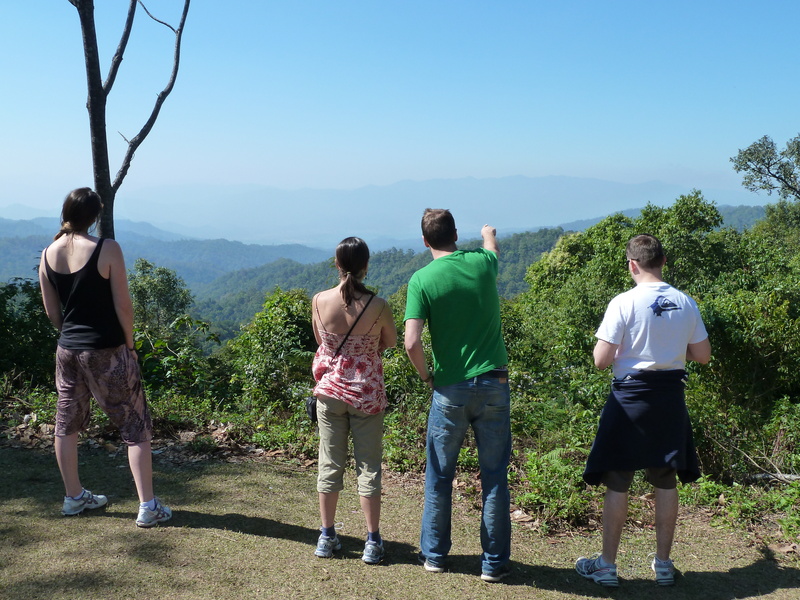 There are companies that will do visa runs for you, but it costs a lot of money and involves a trip to a Thai consulate somewhere and paying for a visa – about £60. I figured that I needed to head south towards Malaysia, where there’s a border crossing, and the possibility of a visit to Kuala Lumpur. Its somewhere ive never been before, and if you have to leave the country, you may as well go and explore somewhere. 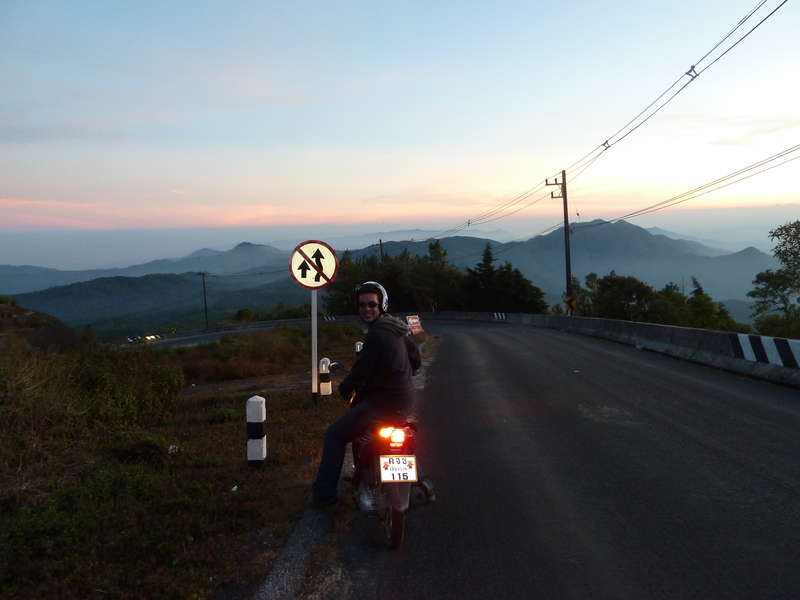 I made my mind up, that’s where I was heading, and so rode my scooter to the railway station and booked an overnight train to Bangkok that night. Newly coloured-in scooter said goodbye to the hostel! On the way back I stopped off at a shopping centre. I needed some blue and black permanent marker pens – a little DIY patch up job was required on the scratches on my scooter in the hope I could make them less noticeable. If they had a Halfords over here, I’d have probably got a proper touch up paint kit, but as it happens, marker pens are equally as effective! With my scooter coloured in, I donned my fleece and jeans in the mid afternoon heat to cover up my road rash scars (apparently they are giveaways to check the bike closely!) and sweltered my way back to the hire shop. As soon as my driving licence was back in my hand, I got out of there while the bike was still being given a once-over. I’d got away with it, minus a bit of skin here and there, but on the whole I was very relieved. I’m probably going to put my motorbike days behind me for a while and quit while i’m relatively ahead! Back at the Spicy Thai I said goodbye to everyone and headed out to catch a taxi to the railway station. With an hour to spare before the train, I had plenty of time – or so I thought. Aside from the fact I managed to put my foot straight into a red biting ant nest while waiting to cross a road, resulting in a very amusing funky chicken dance from yours truly for the scores of drivers waiting for a green light, there was not a taxi or tuk tuk in sight. When one did turn up, there was just 35 minutes before my train left. But the driver decided to pick up and drop off lots of locals first, before dropping the bag laden foreigner off for his train. With just seconds to spare, a train guard ushered me in through a back carriage door, and a few moments later we began to move. It was far too close for my liking -and I still had crushed ants all over my feet. But the stress was over, I was on my way to Bangkok. A week and a bit after the rest of my tour mates left me in the north, I too was heading back, and settled down for supper in the dining car. 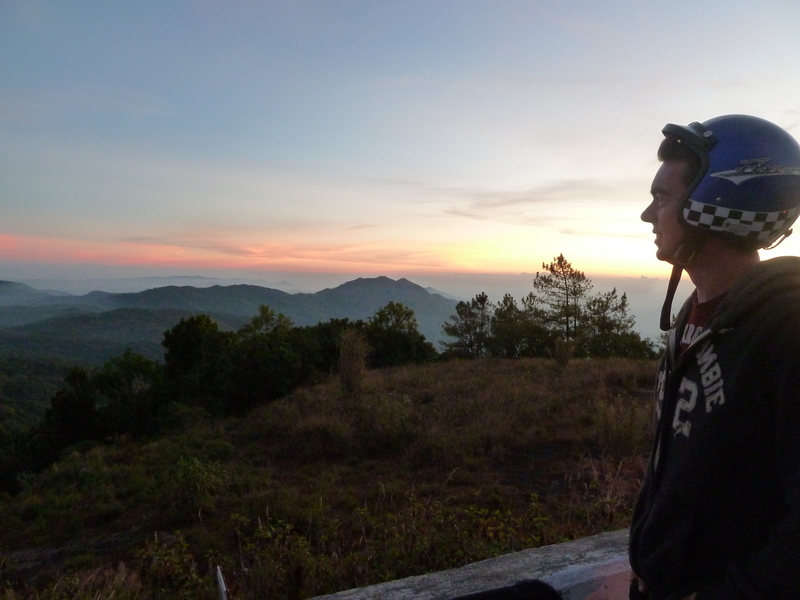 This entry was posted in Uncategorized and tagged afishoutofgrimsby, backpacking, chiang mai, crash, geysers, hostel, mopeds, pai, phil norton, phillip norton, sang som, scooters, spicy pai, spicy thai, thailand, waterfalls by afishoutofgrimsby. Bookmark the permalink. Yet another amazing blog. Keep them coming and if you hire another motor cycle get some gloves! Thanks Philip! I’m staying away from two wheels for now – seen too many injuries caused by them down on the islands and trying to avoid an early flight home! Pleased to say my arm healed nicely too! !